A dental implant is a titanium “root” that integrates directly with the surrounding bone and replaces the function of the natural tooth. The aim is to improve your health, chewing function and/or appearance. Once the restoration is complete you will be able to enjoy a wide variety of foods again. • Protection and preservation to attach a conventional bridge the dentist often needs to grind down healthy, neighboring teeth. Using dental implants, this is not necessary so healthy teeth are protected. When you lose a tooth, the jaw bone and gum may shrink. Implants protect healthy teeth by preventing bone loss. • Make you feel comfortable. You can eat whatever you want, your teeth are strong and stable. They look and feel like your own teeth, no one will know that you have an implant. • Long-lasting solution. When you maintain good oral hygiene, including regular cleanings and routine exams, your implants can last several years. After a detailed consultation and examination, a cost projection will be prepared by your oral surgeon. Once your questions have been answered and you are comfortable, your implants will be placed. When your oral surgeon is satisfied with the stability of your implant, you will be referred back to your general dentist for the implant abutment and crown. An individual schedule will be created for your care. Usually, 5-10 visits are required over 6 months to a year. What other procedures are done with dental implants? Often when a tooth needs to be extracted there is bone loss. To ensure the best chance of successful implant integration, bone grafting may be recommended for you. Often your oral surgeon will take a 3D CT scan to evaluate bone levels and determine ideal implant placement. You can eat whatever you want – your teeth are strong and stable. They look and feel like your own teeth too. You know that you have chosen the best solution and can smile a confident and beaming smile. When you maintain good oral hygiene, including regular cleanings and routine exams, your implants can last years. This makes implants an efficient and economic long term solution. When you lose a tooth, the jaw bone and gum starts to resorb, and continues if you lose several teeth. 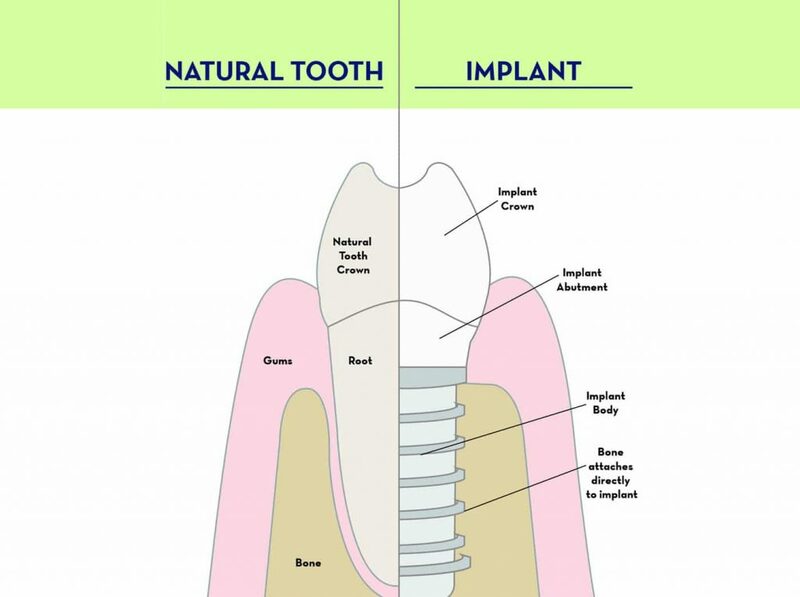 Implants protect healthy teeth, prevent bone loss and help you keep your natural look. To attach a conventional bridge, the dentist often needs to grind down healthy neighboring teeth. Using dental implants, this is usually not necessary healthy teeth are protected.